A slightly abridged 2014 interview with Molly Sheridan for "Fearless Slides", part of New Music USA's "New Music Box" series - clips from a performance and at home. A conversation about my relationship to the pedal steel guitar, some of my philosophy, and my approach to sound and music in general. This project contains music that I am currently working on, and music that was released this past year. In April of 2016, Mystra Records released Evening Tales, a vinyl record of solo music, my most personal album, I think, a record of pieces that I've recorded over the past few years, many of them written for people and places important to me. "The Healer" was written for my friend, the acupuncturist Diana Keener. "Blues for Chi-peh-tah", a piece commissioned by Baltimore's Single Carrot Theater, is an awkward conversation between a coyote, a desert finch, and a quest for meaningful connection. "An Evening Tale" is a sort of America folk melody that veers tonally to the left . "Sapphire" is experimental in nature with use of extended techniques. "Allegretto for David" is loosely based on Beethoven's Allegretto, but travels into some some different places. "The Bobby Bowman Stomp is a country-western inspired tune I wrote for my old friend, the late pedal steel guitarist Bobby Bowman. Later in the year, an album that often featured my pedal steel guitar, the Mary Halvorson Octet's Away With You, was released by Firehouse 12 Records. This was, in part, the culmination of a year of back and forth conversations between the composer and bandleader Mary Halvorson and myself - figuring out how to write for the instrument, what its strengths and limitations were, what octaves worked best, etc. Then I had to learn and later memorize the pieces. "Away With You" received significant critical acclaim and was on the top ten list for best jazz albums of 2016 in the New York Times (best album of the year), Chicago Reader (best album of the year), NPR, LA Times, The Atlantic, All About Jazz, El País (Spain), and Quietus (UK). Also, in 2016 I did quite a bit of touring which, I think, is good for you as a musician; you're playing in a different place every night, driving miles and miles through mountains, prairies, deserts, sunrises and sunsets, with only the radio, CDs, and your own thoughts to keep you company. It is a profound disconnect from your daily life at home, but a precious opportunity to meet people in different places and different countries to share your music, to give a new voice in performance to whatever it is your art has to say. Ideas and inspiration come at a moment's notice allowing you access to a deeper part of your self and a different shade to your performances. Some video from these tours is included in this section. When I recorded this piece in August of 2013, I was thinking of my friend Diana Keener and that I had totally forgotten my acupuncture appointment with her (and not for the first time), so, for some reason, I turned on my recording equipment and began to play. This is what came out. In this piece, as, I suppose, with all of my music, I try to balance consonance and dissonance, notes and the space between the notes, stasis and disquiet. In my mind, "Evening Tale" is a narration, perhaps recited in times before the written word, when it was not uncommon at night to sit around a fire and tell stories, legends or tales, this one being of a woman who had done something heroic. Musically, it stays in comfortable, but perhaps mysterious, major and minor tonalities At 3:18 there is a 1-6-4-5 that is a reference to some of the late fifties/early sixties music I heard on the radio as a child. Blues for Chi-peh-tah, was commissioned for a profuction at the Single Carrot Theater in Baltimore, Maryland. In March of 2014, I spent a day walking through the dirt, sand, and rocks of Cutthroat Ruins in a remote desert area of southeast Utah. While there, I made a field recording of the wind and of a very short duet between the a desert finch and myself on viola which was the reference to compose and record this piece. I wrote this piece for my husband David loosely based on the melody and chords of the Allegretto from Beethoven's 7th Symphony. This piece in many ways signifies our relationship and marriage - deep, passionate, and joyful, but not always easy and, like life itself, not always without pain. Dedicated to my dear friend Bobby Bowman, a pedal steel guitarist who passed away in July of 2014. He was a big fan of my country-western playing and always wished that I had stayed in that genre. For years, whenever there was a video or recording of me playing country music, I would send it to him as if to say, "See, I haven't abandoned country." I miss those times. This piece was composed and recorded while he was still alive. Now whenever I hear it, I think of the man, a gentle and giving human being, and his legacy. "The Absolute Almost (Octet no.52),written by Mary Halvorson for the Mary Halvorson Octet, is included on the album "Away With You" (Firehouse 12 Records). This piece features a pedal steel solo at the beginning; Mary Halvorson joins in on guitar, we play the melody,then the bass player joins us; and then the rest of the band comes in. After a lively form, the piece ends with free improvisation, and closes with the phrase that began the piece. Mary Halvorson's composition "Fog Bank" (Octet no.56), from the "Away With You" album, performed by the Mary Halvorson Octet at the Stone in NYC on August 6, 2016. I play a rather lengthy pedal steel guitar solo at 1:54. Susan Alcorn at the Silent Barn - "The Healer", and "Louange à l'Éternité de Jésus"
This is from a performance on January 9, 2017 at the Silent Barn in Brooklyn. It was cold inside and snowy outside that night, and I thought about keeping on my winter jacket while I performed. There are two pieces on this video , one of my compositions,"The Healer", and "Louange à l'Éternité de Jésus" by Olivier Messiaen from his Quartet for the End of Time which he composed during the the Second World War from inside a Nazi prisoner of war camp. I have a special love for lyricism, gentleness, feeling, as well as the intense explorations in the music of saxophonist/trumpeter Joe McPhee. This video is of the end of our set an hour-long at the Cropped Out Festival in Louisville, Kentucky, playing "After the Rain", our tribute to John Coltrane on the occasion of his 90th birthday. 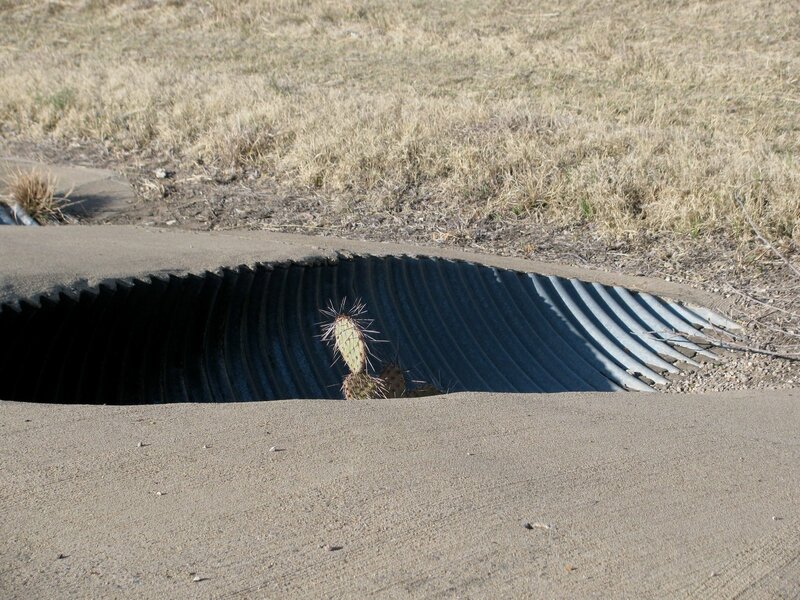 I took this photo about five years ago by a rest area somewhere north of Amarillo in the vast arid plains of the Texas Panhandle. To me this little cactus exudes a sense of optimism. This little plant didn't ask to be born in the middle of a roadway, but there it is, and it will make the best of it. This, in a way, is how I see musical (and all artistic) projects - often an arduous journey from seed to fruition, but what choice do we have? We carry on because that's what we do. In 1987, Astor Piazzolla and his sextet came to Houston, Texas where I was then living, and I took the night off from a regular engagement playing in a country-western band to see him, at the time wondering if it was worth a night without income. However, once Astor Piazzolla opened the bellows on his bandoneon (a button accordion used in tango music), I was entranced. And I was especially mesmerized by the little finger on the left hand of the pianist and the very low bass notes that punctuated the musical arrangements. That night has stayed with me ever since, and since that moment I've had a burning desire to transcribe and play Piazzolla's music in a solo recording. Thirty years later, I sometimes wonder whether that night in Houston was a blessing or a curse (perhaps a bit of both). Over the years a lot had changed. I'd grown older, my approach to the instrument I play had markedly changed as well as my approach to music in general and life. This album is a bit of a testament to what has remained from that night and what has changed. In the winter of 2012-2013 I holed up in my music studio and began work on this album, often working 12-14 hours a day to transcribe the music in a way that would fit my instrument and also do justice to Piazzolla's musical vision. I chose four of his pieces, "Soledad" (Loneliness), "Invierno Porteño" (Winter in Buenos Aires), "Adios Nonino" (Good-bye Grandfather), and "Tristezas de un Doble A" (Sadnesses of a Double A - "Doble A" is a brand of bandoneon) and included one of my own pieces, a milonga entitled "Suite for Ahl". With the exception of "Soledad" and "Invierno Porteño", each piece contains extensive free improvisation based on the melodies, harmonies, and moods of the pieces. The Piazzolla pieces are solo, and Suite for Ahl is a duet with Michael Formanek on double bass. This recording was released in March of 2015 on the Relative Pitch Label. I've also included in this project, a live recording (not on the album) of my composition "Suite for Ahl" that I arranged for a quintet with brass, performed on May 30th, 2012 at the Issue Project Room in Brooklyn, NY. The musicians were Michael Formanek (double bass), Ryan Sawyer (drums), Darius Jones (alto sax), Steve Swell (trombone), and myself on pedal steel guitar. 28 years ago in Houston I saw the legendary composer and musician Astor Piazzolla perform with his quintet; it was an experience I will never forget. That night I told myself that someday I would record a solo album of my version of his music, and five years ago when my teaching career at Baltimore City Public Schools came to an end, I began the process for this recording. The resulting album, titled "Soledad" was released in April of 2015. 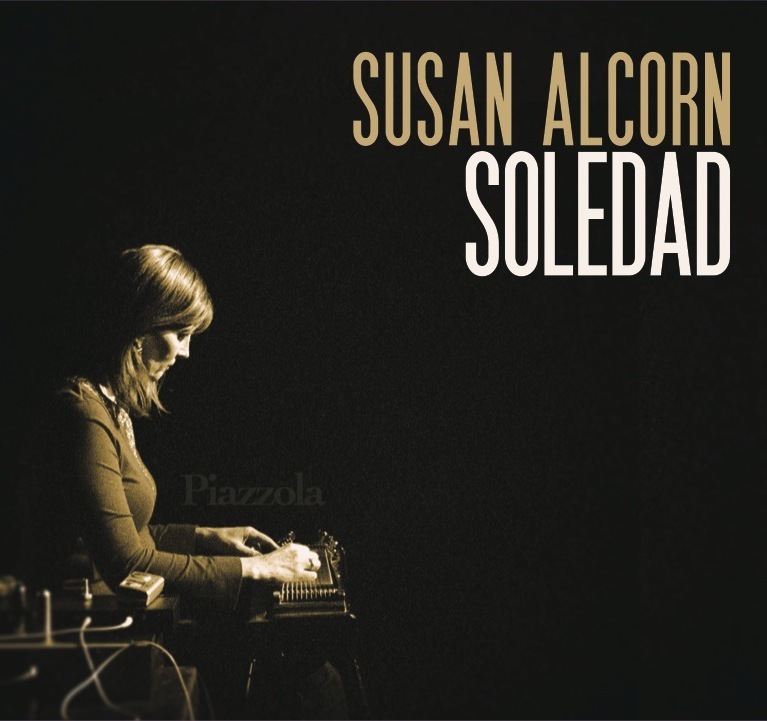 Astor Piazzolla's "Soledad" is a song that speaks to me on a deep level, and I felt a need to record it. This is the first piece of Piazzolla's music that I worked on for the album. I began working on it about ten years ago, and since then the arrangement and my approach to the notes in this piece have changed, as I too have changed. "Tristezas de un Doble A" translates as "Sadnesses of a double A". Some say that the "Doble A" refers to the brand of bandoneon that is highly revered in tango music; others say that it refers to "Astor and Amelita" who was his partner at the time. In this transcription, I follow the arrangement of Piazzolla's quintet version for the first minute, then begin improvising on the moods I feel from this piece. Upon hearing that his father had died, Astor Piazzolla went into his music room and came out a half an hour later with "Adios Nonino" (Good-bye Grandfather), the most well-known of all his compositions. In my arrangement, the piece starts out with improvisation, sometimes free and sometimes referencing Piazzolla's melody. After 6 minutes or so, the melody comes in, and everything after that is related to the melody itself. I wrote "Suite for Ahl" five years ago for a trio I was in at the time. This duet version features Michael Formanek on the double bass and myself on pedal steel guitar. It was recorded live in my studio in April of 2013. This piece had three sections. The first, the melody is a "milonga", a slow minor chord tango. After the melody, it devolves into bird song, then improvisation. The return to form is signaled by harp-like motifs I play on the pedal steel. Then come A-minor chords. "Inverno Porteño" (Winter in Buenos Aires) is part of Piazzolla's "Four Seasons" suite. In my arrangement for solo pedal steel guitar, I try to stay close to the original version with small changes in chords and melody to give it more of a personal touch. Upon listening closely, you can hear the whole gamut of emotions in this song, much of it sad; the ending, which I love and which originally attracted me to this song, ends on a note of sweetness, hope, and optimism. This is an arrangement I wrote for a 2013 residency performance at the Issue Project Room in Brooklyn, NY. In this version, I wanted to showcase some of New York's best improvisors inside the framework of this piece. The personnel is Michael Formanek (double bass), Darius Jones (alto saxophone), Ryan Sawyer (drums), Steve Swell (tronbone), and myself (pedal steel guitar). From a live performance at the Audio Foundation in Auckland, New Zealand, November 21, 2015, this video is a medley of three songs - my own composition "Mercedes Sosa", then Astor Piazzolla's "Tristezas de un Doble A" and "Adios Nonino"
This is a video (shot at home in the spring of 2016) of the title piece of the album "Soledad". Substratum is a collaboration with composer Jeff Snyder on a new music composition, the first ever, as far as I know, for pedal steel guitar and string quartet. Substratum was written for me and the Mivos Quartet and performed February 18th, 2014 at Princeton University's Sound Kitchen. The Mivos Quartet is an incredible group of musicians. We had one rehearsal two days before the performance and a short run-through sound check; this video is a record of what happened that evening. Music like this is funny - you learn, practice, rehearse for hours, sometimes days, sometimes months, stress about it on the day of, then after ten minutes or so, it is all over; time to move on. In this video, part of an interview with Molly Sheridan of New Music America's NewMusicBox, I explain the process of my collaboration with composer Jeff Snyder for his piece for pedal steel guitar and string quartet "Substratum". 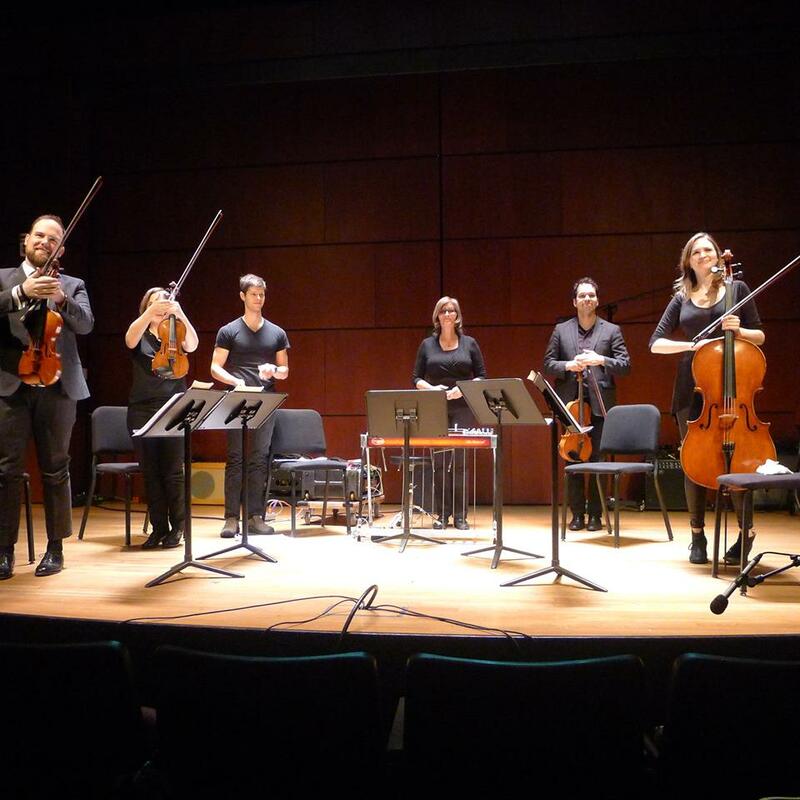 Substratum performed by the Mivos Quartet (violinists Olivia De Prato and Joshua Modney, violist Victor Lowrie, cellist Mariel Roberts) and myself at the Princeton University Sound Kitchen, February 12th, 2014. Video courtesy of Jeff Snyder and Princeton University. Left to right: Josh Modney, Olivia De Prato, Susan Alcorn, Victor Lowrie and Mariel Roberts February 18th, 2014 at the Princeton University Sound Kitchen. Photo courtesy of Princeton University. 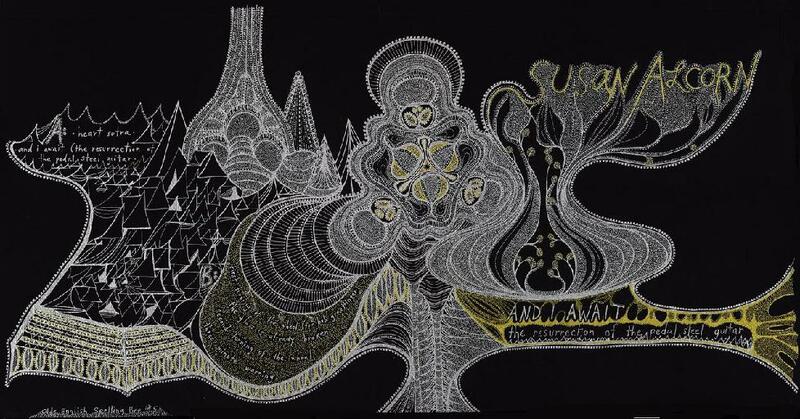 These are clips of free improvisation performances where there is nothing predetermined. In some cases, I had just met the other musicians minutes before playing together. All music is composed spontaneously in the exact moment that it happens. There is quite a freedom and beauty in this approach because everything is "in the moment". It's also perhaps the most difficult of all music genres to play well because you have to be mentally and physically awake, alert, and immediately responsive to what you hear, the result of which is seldom predictable from one moment to the next. However, the surprise that comes from this meeting of minds, hearts, senses, and tastes can be truly magical. This was recorded four years ago at the Issue Project Room in Brooklyn, NY with banjoist Paul Metzger. I had never met Paul before this, and before playing together, we had said hello to each other and nothing more. Paul has a style derived more from Indian classical music and 20th century free improv than any traditional "banjo" associated genre. It was a joy playing with him I think we both surprised each other during this performance. Video by Damian Calvo. Vinnie Golia, a musician specializing in reeds, and a professor at Cal Arts Institute in California. This is the first of three videos, each with different instrumentation on his part. We had just met, and for much of this first video, we are checking each other out, listening for the melodic and harmonic sensibilities of each other, and going on from there. To my ears it got deep pretty quickly. In the next video, I think we become a little more comfortable with each other and begin to stretch out. Video by Kevin Reilly. On this one, Vinnie is playing baritone saxophone. Video by Kevin Reilly. Evan Parker and Michael Formanek are both world-renowned musicians at the absolute top of their forms. Part two of the same concert. Video by David Lobato. This video was at Firehouse Gallery in Philadelphia, PA in 2012. Saxophonist Phillip Greenlief, based in Oakland, California, is one of my favorite musicians, and we pay together whenever he is on the East Coast. He has such deep and finely attuned ears. Video by Kevin Reilly. This took place on a warm evening in June of 2012 at Zebulon in Brooklyn, NY. Steve Swell played trombone, and Ryan Sawyer played drums. The three of us had performed together a few weeks earlier for my Piazzolla project at the Issue Project Room. Here we played with more abandon and sort of went for broke; it was one of the most physically demanding improvisation performances I had ever done. It was also one of the most enjoyable. Video by Rose Thomas Bannister. The Baltimore Boom Bap Society is a loosely knit collective of musicians that performs freely improvised hip hop music in Baltimore. That night's ensemble ( at Baltimore's Windup Space) )was Wendell Patrick (Kevin Gift) and Erik Spangler on turntables and electronics, Eze Jackson on vocals, beat-boxing by Shodekeh Talifero, and myself playing pedal steel guitar. Video by Tom Kessler. This is a video, recorded at The Stone in NYC, September 2016, of a free improvisation trio with Nels Cline (guitar), Chris Corsano (drums and electronics), and myself. Video by Don Mount. 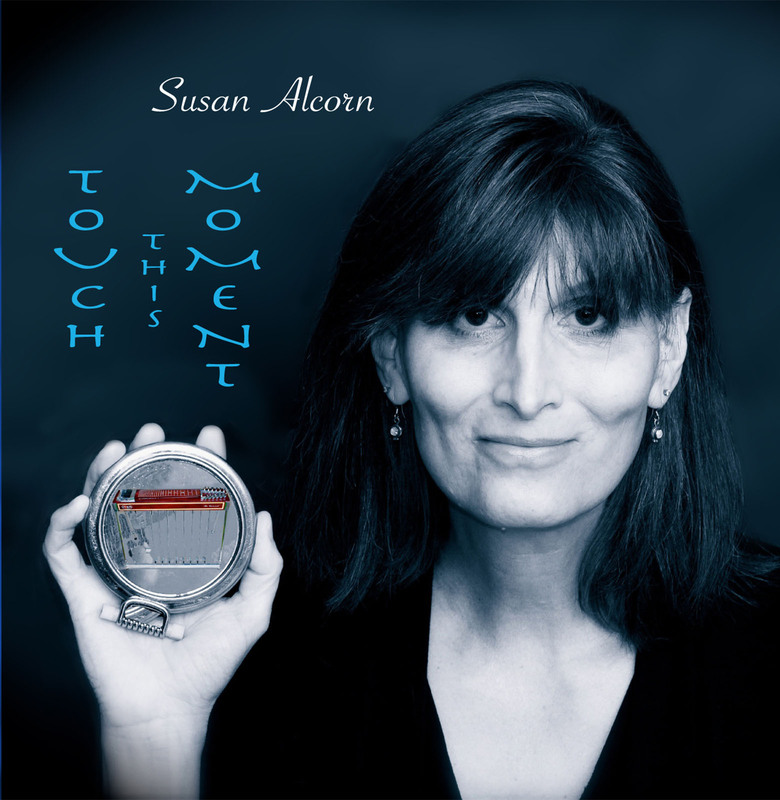 The self-released "Touch This Moment" (2010) is the first album I composed and recorded after moving to Baltimore in 2007. It includes a lot of the ideas that were going through my head in this new environment. On much of it there is more emphasis on sound as opposed to traditional melody. It also reflects my experiences. Perhaps, somewhere along the way, the music in here lost a bit of its sweetness, I don't know; but it's honest, and if nothing else, you need to be true to that. Perhaps if Johann Sebastian Bach had lived in the year 2009, was a woman and a pedal steel steel guitarist of modest talents who had listened to Oliver Messiaen and Philip Glass, this piece could have been the result. 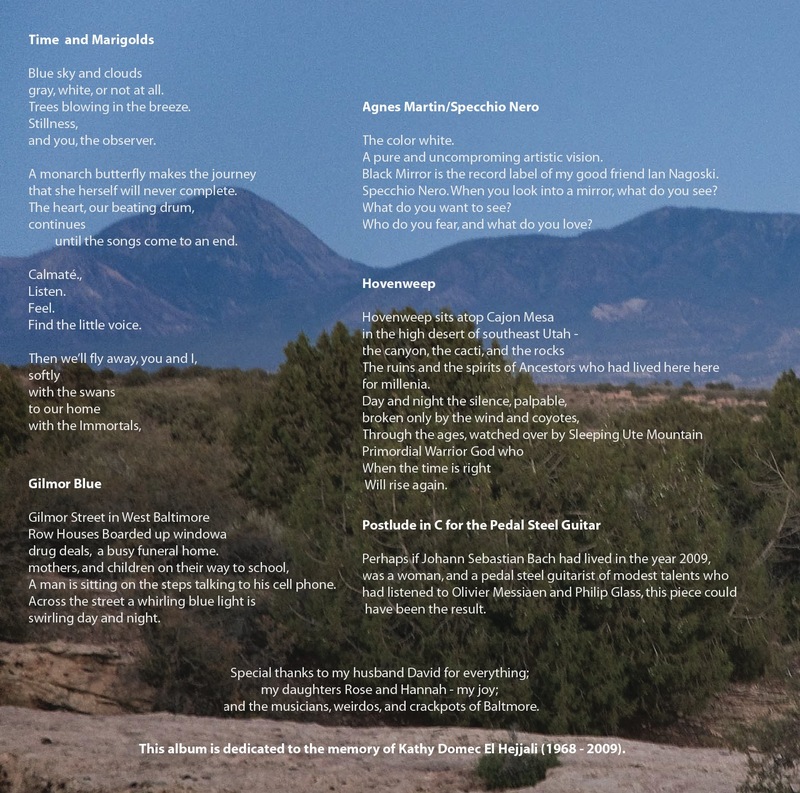 [from the liner notes] Hovenweep sits atop Cajon Mesa in the high desert of southeast Utah the canyon, the cacti, the rocks, and the sun. The ruins and the spirits of the Anasazi Ancestors who had lived there for millennia. Day and night the silence, palpable, broken only by the wind and coyotes, Through the ages, watched over by Sleeping Ute Mountain, the primordial warrior god who when the time is right will rise again and right all wrongs. [from the liner notes] Agnes Martin - the color white; A pure and uncompromising artistic vision. "Black Mirror" is the record label of my friend, the musician, historian, and archivist, Ian Nagoski. Specchio Nero. When you look into a mirror, what do you see? What do you want to see? What is fear, what is love? In 2007-2008, I spent a year teaching at a school on Gilmor Street in West Baltimore, a street lined with abandoned row houses, a liquor store, and a busy funeral home; and a school year punctuated by street-level drug deals visible from the classroom windows, funerals, shoot-outs, school lockdowns, teenagers tramatized by the murder of family members, poverty, and the beautiful souls who worked there, trying the best they could to help the students when possible, and when not possible, being a soft shoulder for them to cry on. This song is about the street, the school, and the people. [from the liner notes] Blue Sky and Clouds gray, white, or not at all. A tree bows to the wind.. Stillness and you the observer. A monarch butterfly begins the journey that she herself will never complete. This heart, our beating drum, continues until there are no more songs. Calmaté (say the chilangos), tranquilaté. Listen. Feel. And then we'll fly away you and I, with the swans to our home with the immortals. 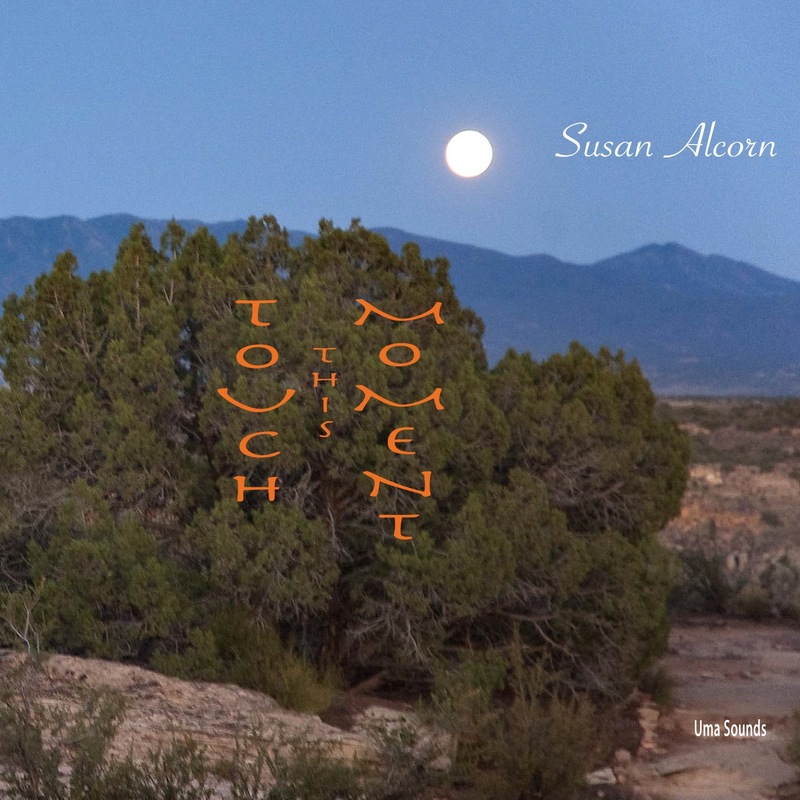 I wrote and recorded the music of Touch This Moment from 2008 to 2010. The album was self-released in 2010. I think it sold about five copies and was generally ignored, but I really like this album. I like the music on it, and I'm glad I recorded it. This is an album I recorded in the winter and spring of 2006. It was released on vinyl a year later by the label Olde English Spelling Bee. [from the liner notes] “Thus have I heard. Once the Blessed One was dwelling in Rajagrija at Vulture Peak Mountain . . .” This opening piece is for the most part a monotone recitation of the Heart Sutra, the “Sutra of the Heart of Transcendent Wisdom”, as translated by the Padmakara Translation Group, delivered by the Buddha some 2,500 years ago on Vulture Peak Mountain. His message, in so many words, was that “Form is Emptiness” and “Emptiness also is Form”. [from the liner notes] I remember very clearly the first time many years ago I heard Olivier Messiaen’s massive “Et Expecto Ressurectionum Mortuorum”. I was in my car driving down the freeway in Houston, Texas on my way to a country-western gig. To say I was overwhelmed would be an understatement. After two minutes or so I had to pull over to the side of the road until the music ended. It has been with me ever since, from the low octaves at the beginning to the gripping propulsive conclusion. This was written to accompany a recitation of the short poem “Broken Glass” by Amarillo, Texas poet Richard Todd. [from the liner notes] "The First Turning of the Wheel" was my open letter to the late Bob Graettinger, the brilliant composer and arranger for Stan Kenton’s “This Modern World/City of Glass”. To my ears, Graettinger’s work conjures a stark landscape of urban alienation, existential loneliness, and (oddly enough) musical beauty. This song is like a conversation with a dear friend, one whom I’d never met, but a fellow human being. A soft hand on the shoulder, a touch to express what in words is inexpressible. [from the liner notes] This piece is a continuance of the silent conversation of “The First Turning of the Wheel, but with a slightly different touch, sound, and emphasis. [from the liner notes] Quite often these days, I find it difficult to retain my sense of optimism for the future – both of the planet on which we live, and for the lives of the people, animals, and plants who inhabit it. Three minutes is a relatively short amount of time, but with the immanence of danger in the word “warning”, there is always implied a glimmer of hope. For me, it is music that is hope – the notes, the sounds, the vast and limitless universe that exists within and between each note, each sound, each breath, and every smile. It is my hope that we all awaken to this melody. These are the liner notes for the album. 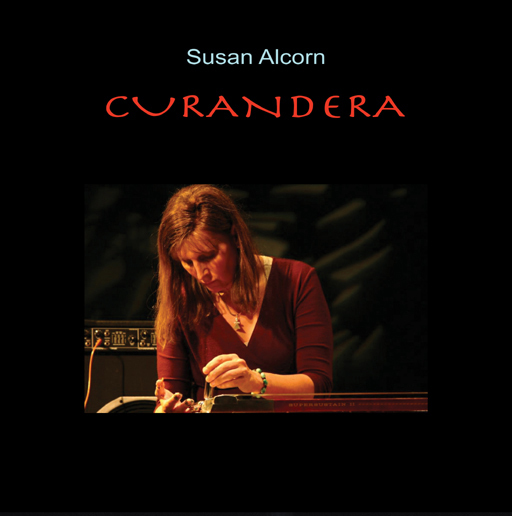 "Curandera" (Uma Sounds), which was originally released in 2005 (Fleece), then again in 2008 (Majmua) and 2010 under my own imprint, is an album of my original compositions and my transcriptions of songs by Curtis Mayfield, Tammy Wynette, and Olivier Messiaen. In 2003 I spent a good amount of time in Chile, a country of both Spanish and Indigenous heritage. Chile's Mapuche people were the last group to hold out against the intrusion of the Spanish. In their traditional music, there is often an indefinite and gradual rise and fall of pitch in the human voice. This is the basis for the beginning of "Curandera" (Woman Healer). I wrote "Twin Beams" early one morning in Leipzig, Germany for a performance by the Chris Cutler Project, at the Leipzig JazzTag festival in 2002. Twin Beams is an international symbol of distress, and this piece echoes the uncertainties in the world and inside each of us after the events of 9/11. On Sunday, March 16, 2003, I attended a silent candlelight vigil for peace at the reflective pool outside the Rothko Chapel. There was only a handful of people, none of whom seemed to know each other - beautiful silent faces in the dark. Uneasily in the middle of a reflective pool sat Barnett Newman’s "Broken Obelisk", a tribute to Dr. Martin Luther King. I came home and recorded this piece. The country singer Tammy Wynette has long been a favorite of mine - her heart, her phrasing, the way she has of bringing out the deepest meaning of a lyric. "You and Me" was one of her biggest hits and one that particularly resonated with me. When Tammy recorded it, there was one modulation. In my version, there's a modulation after each verse and then even more frequent modulations. All this while hopefully retaining the the quietude, space, and deceptive simplicity of the song. "O Sacrum Convivium" is a choral piece composed by Olivier Messiaen. The first time I heard this piece, I broke into tears, and sometimes I still do. This video, shot at home, is my rendition of Olivier Messian's choral work, "O Sacrum Convivium". In Gloria Naylor’s novel, "Mama Day," the aging matriarch of an African American family in coastal South Carolina goes out alone into the woods for one last walk. In this song, I try to feel and communicate the moods and thoughts of Mama Day as well as the plants, animals, and sounds of her last walk. I recorded Curtis Mayfield's "People Get Ready" as a knee-jerk response to what happened in and to the city of New Orleans and its people after Hurricane Katrina. I was so angry. I hope that the anger didn't spill over into the song. I felt it as a sober recognition of what is and nodding certainty that, though it won't be easy or neat, things will someday improve. A review of Curandera in the online magazine "Dusted". Music, as with all art, is communication, and as such we communicate with other human beings - collaborating, soaking in, together finding meaning. My long term collaborations with other musicians has been, and continues to be, an interesting ride. I seem to have been drawn in like a magnet to a fascinating and musically-rewarding life of collaborations with various "outlier" musicians, a collection of geniuses who inhabit the fringes of the musical world - people like guitarist and vocalist Eugene Chadbourne, the mysterious Jandek (whose name for many years provoked discussions as to whether he even existed), Maryland's own Zane Campbell who fuses a legacy of hillbilly mountain music with punk, country-western, Irish, and rock; Josephine Foster, a pianist, guitarist, conservatory-trained operatic singer, and songwriter; Dan Dutton, an artist, sculptor, composer, gardener, and songwriter; the twisted Great Plains beauty of Rose Thomas Bannister's music; Carri Norris, a songwriter and singer of Kentucky mountain ballads; among many others. Zane Campbell is a haunted but unapologetic genius - a visionary artist, journalist and musician who combines his deep hillbilly roots (his aunt was Ola Belle Reed) with country, punk (from his days in NY hanging out with the Ramones), Irish, and his own inimitable style. This song "Fess Up" is from a concert at Baltimore's Creative Alliance on September 18th, 2014. When we were recording this song several months earlier, Zane looked at me and said, "Well . . . you certainly don't have a problem with 'weird'". Of all the songs I've recorded on over the years, this traditional folk ballad is one of my favorites. I love the lyrics, the poetry of the lyrics, but most of all, the honest and unadorned voice of Carri Norris, a Louisville, Kentucky folk singer, song writer, and multi-media visual artist. "Layaway Plan", recorded in January of 2014, is a song that NPR described as "the saddest Christmas country song"(full article at http://www.npr.org/2015/12/15/459670044/songs-we-love-zane-campbell-layaway-plan). Musicians on the session were Zane Campbell (vocals), Anna Roberts-Gevalt (fiddle), Walker Teret (double bass), and myself. Josephine Foster is an operatically-trained singer, a guitarist, pianist, and composer who always reminds me of a vaguely-defined bygone era (like she just stepped out of the Bloomsbury Group or my grandmother's record collection) combined with an affinity for contemporary outsider music. This is from a live performance on March 13th, 2014 at MoMa ps1 in Long Island City, NY with Gyða Valtýsdóttir on cello and myself on pedal steel guitar. This video, "Keep the Wild Honeysuckle" is from a rare live performance by the Somerset, KY artist, sculptor, composer, and librettist Dan Dutton. It features Dan Dutton (guitar, vocals) accompanied by Shane Gilmore (guitar), Brent Olds (bass), Baoku Moses (conga drum), and myself on pedal steel guitar, at the University of Kentucky in 2011. "Horses and Mules" is a song written and performed by Dan Dutton, an artist, sculptor, environmental art designer, composer, and musician who lives in the house on Dutton's Hill near Somerset, Kentucky where he was born and where his family has lived since before the Civil War. Throughout the years, I've played pedal steel guitar on several of his projects. The song of this 2012 recording is part of an album, so far never released, based on his family's history and his relationship to the land on which he was born. Rose Thomas Bannister is a songwriter and a singer whose songs evince a musical maturity and wisdom beyond her years. Having grown up in an extreme-fundamentalist Christian family, discouraged from reading or listening to music, she found her own voice when she was in college, to the extreme consternation of her family and former friends. Much of her music shows echoes of her childhood and its aftermath. She now lives in Brooklyn, NY. Rose Thmas Bannister (formerly Ember Schrag) with Helena Espvall (cello), Evan Lipson (bass), Gary Foster (drums), and myself (pedal steel) live at the Highwire Gallery, Philadelphia, PA, April 5, 2012. Sometimes I think that Jandek, the reclusive (for years there were disagreements among journalists as to whether he even existed) musician who has been making records since the mid-70s is the ultimate "outsider" and "visionary" musician. His songs, combining darkly poetic lyrics with an almost haphazard improvised music, to me, seem to challenge the notion of what is and what isn't music. He's right on the edge, and listening to his music is a liberating experience. 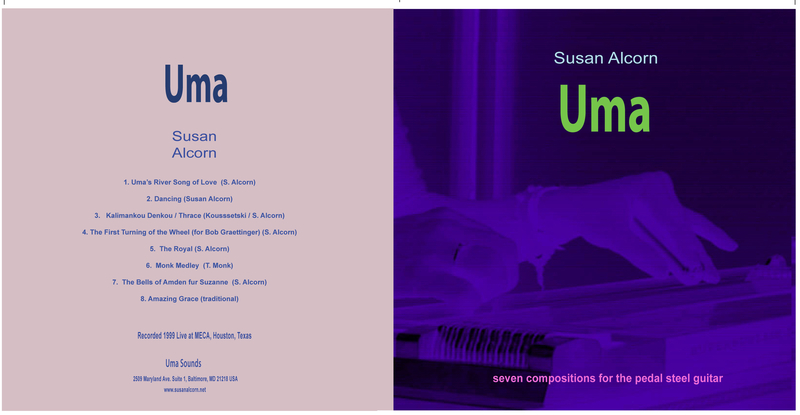 Uma was my first solo album, released in 2000 on the Loveletter record label, again in 2002, for European distribution, on the ulftone label, and finally self-released in 2010. I remember at the time, I thought my days as a musician were coming to an end, and I just wanted to document the music I had written and the music I had been performing (that sense of a personal dies irae had followed me throughout the early years of my recording projects). David Wilcox, owner of the the small label Loveletter, graciously gave me that opportunity. This CD is a picture, for what it's worth, of where I was physically, emotionally, and spiritually, at a certain point of time and in a certain space in August of 1999. The songs were recorded on a hot afternoon, live in an empty auditorium within the space of a few hours. 'It is another name for the goddess,' the Naga Baba replied, lifting her into a large, flat-bottomed ferry crowded with farmers taking their produce to a weekly market. 'Uma' means 'peace in the night.'" "Uma's River Song of Love" is actually two songs, or rather a compendium of two disparate ideas that seemed to have needed to be in the same song. The first part is loosely based on an Indian theme; I wrote this shortly after reading the book A River Sutra by Geeta Mehta. "Uma" is the name of a goddess; it means "peace in the night". In a world, a universe of notes, how can we speak of consonance or dissonance; there is sound and what we make of it. Notes lay upon chords (which are in turn made up of notes) like flowers on water. Why do they float or sink? I have always found inspiration in dance. I’ve spent most of my life playing in dance halls, and I love to watch people dance. I’m not really sure what else to say about this one, except that the song makes me happy, and for some reason approximates a sense of joy whenever I think of it. David Dove and Suzie Wasserstom also played on this one. In our discussions on the role of the bells for this part of the recording, we had an image of yak bells, and later we joked that this song should actually be called "Dance of the Laughing Yak Bells". What can be said about Thelonious Monk and his music that hasn't already been written? When I think of Monk's music, I think of mythic buildings -- elegant, gritty, and wise structures, buildings steeped in the past, but imbued with a strange modernity (not unlike Sun Ra); you look at these structures so solid, but so delicately balanced that you are amazed that they don’t just fall over. And if you went inside, you would find an inner logic that had for so long evaded you. And if you looked out the windows, you would see the rest of the world as oddly askew. "The Royal Road" is based loosely on two Indian ragas ( the "Kalyan" which has a raised fourth and the "Bhairavi" which is not unlike the phrygian mode in western music) and a sequence of Messiaenic chords that represent a subtly rising sense of the ecstatic. After the chords there is another rising sequence -- this time of single notes, including a whole tone series, that represents the individual’s own path toward self-realization, liberation, or whatever. As you reach the top, the final octave note becomes more elusive. "Mercedes Sosa" was a singer from Tucuman, Argentina, but the term "singer" cannot begin to accurately describe the depth, the passion, and the love that came from her music in the space of a line, a phrase, or a single word. Her music reflects a sense optimism from a generation that has seen both the best and the worst of times in South American history, from the gatherings of friends to the coups, the dictatorships, and the massacres. In exile and return, she had become on of the most recognized cultural voices of Argentina throughout the world. [from the liner notes] Some years ago I was in Switzerland for a concert with a country western band from Texas, and we were guests at an old house in the village of Amden, high in the Alps. The village had two churches, and the bells would ring every hour. I was entranced by the overtones created by these bells in the clear mountain air, and as they rang, I sat down at my steel guitar, and the first part of the song came out. Our host on this trip was Suzanne Steiner who made sure that we were well taken care of. "Thrace/Kalimankou Denkou" is a song in two parts - one being a mostly literal transcription of the original, a Bulgarian folk song, recorded by the Bulgarian State Television Female Vocal Choir, and the other being a short melody of my own and subsequent improvisation. "Kalimankou Denjou"(which translates into English as "Godmother Denkou") is a song of mourning for a woman who has lost her husband. I think if you listen closely to the song "Amazing Grace", you can hear the entire history of American music. You can hear Mahalia Jackson, Doc Watson, Judy Collins, Joan Baez and Pete Seeger, Lloyd Green and Pete Fountain; I also hear Duke Ellington, Ornette Coleman, Alice Coltrane and Maybelle Carter; David Vest and Bill Monroe; Blind Willie McTell and Charles Ives; Nina Simone; Laura Nyro and Roberta Flack -- a patchwork mosaic fed by strong earthen roots from still waters running deep. My version was recorded at home, overdubbing four steel guitars and one rhythm guitar. Ten years ago, I was asked by Caroline Kraabel, the editor of Resonance, a print magazine put out by the London Musicians Collective to write an article describing a typical experimental music gig - what it was like going to the venue, performing, the people I had to deal with, etc. At that time, 2004-2005, I thought of all the interesting experiences I had had as a performer and came to a conclusion that what might be more interesting would be some of the experiences I had had as a country-western musician. So I wrote about the history of country music in Houston and two typical (in those days) performances, much of it while I was driving to these gigs (thankfully before texting became a thing), putting my pencil onto the paper without looking and deciphering later. "Texas: Three Days and Two Nights" was the result, first published in Resonance magazine, then re-published by the online CounterPunch magazine. They submitted it to Da Capo Press who included it in their anthology, "The Best Music Writing of 2006". People sometimes ask me if I plan to write more, but I'm not sure I have another story of that kind left in me. Time will tell. Three Waters is a short musical travel video through the flatlands of East Texas and southwest Louisiana. "Three Waters" is sort of a musical travel video, shot in 2011, that chronicles a journey my husband and I took from Houston, through the Golden Triangle of Texas, and through Louisiana on Interstate10 where we stopped on the way, at the San Jacinto River, Old and Lost Rivers,and finally the Atchafalaya swamp to get water samples for a friend. The music, recorded along with and after the video follows the flat lasndscape, the rivers, fields, and cultures along the way, in particular the Cajun and Creole cultures of southwest Louisiana.